I’m not a huge fan of standing. It’s better than walking or running, I guess, but not as good as sitting or lying down. So when I say Boston Calling made spending the better part of three days on my feet enjoyable — amazing, even — just know where I’m coming from. An estimated 22,000 people per day filled the concrete desert of City Hall Plaza for the biannual music festival’s third installment, and we braved the crowds to bring you the bests and worsts from the three days. Mostly bests, though, because no one likes a Negative Nancy. Music and fashion trends work in cycles: Guitars are cool, then lame, then cool again. Jeans go from high-waisted to low-rise and back. Just when you finally perfect that Don Draper side-part, everyone’s rocking long, unwashed locks. It probably has something to do with the Oedipal progression of idolizing our parents, then rebelling against everything they stand for, then growing to love and embrace them. There’s nowhere better to observe these cycles at work than music festivals, bringing out swaths of young people eager to look super trendy by wearing stuff that was cool 20 years ago, and 20 years before that. The best example? The band T-shirt that dominated this past weekend’s Boston Calling Spring 2014 edition wasn’t Jack Johnson, Death Cab, or Modest Mouse. It was Nirvana. Just as fun? The people who couldn’t care less about trends and just wear whatever they want. This past weekend myself, Jim Martinho, Katie Pelkey, and @OnlyInBOS took to the concrete jungle of City Hall Plaza to document (via Instagram, obvi) the best and worst of Boston Calling fashion. SO YOU JUST ASK YOUR BARBER FOR “THE MACKLEMORE” OR WHAT? Obvious Child is not your usual fall-in-love-after-the-mess type of story. Yes, it’s a Romantic Comedy, but no, it’s not like the hundred others that are produced a year. It’s funny, and romantic, but nothing is sugar-coated or simplified. Jenny Slate, local-made comedian, actress, writer, and producer leads this comedy through serious situations, bringing a humorous relief to the heavy. Her and co-star Jake Lacy’s character, fumble through becoming more than acquaintances, after a one night stand and their realities; Slate’s character finds herself pregnant in her twenties, financially unstable, and not ready for a spawn. It’s an honest and realistic film that will make you laugh so hard, a few farts will slip out. Jenny Slate Creator of Marcel the Shell with Shoes on, has starred in numerous works, including Bob’s Burger, Parks and Recreation, House of Lies, Kroll Show, Hello ladies, Girls, and The Lorax. Slate will be showing Obvious Child at the Boston Jewish Film Festival on Thursday, May 29th at 7pm (doors close at 6:40), with a following Q&A session. The screening and Q&A with Jenny Slate are free but tickets are required. Reserve your ticket here. Happy Boston Calling day! The biannual — that’s twice a year, every two years would be biennial, see you learned something today — festival returns to City Hall Plaza with three days of music, food and beer. Festival passes are sold out, but you can still purchase one-day tickets for tonight or VIP tickets for Saturday or Sunday. Or, you know, StubHub or Craigslist. Or just deal with your FOMO and get tickets for the September edition featuring Lorde and The Replacements. See, a little something for everyone. There are two stages to minimize set-up time, and set times don’t overlap so it’s possible to see every minute of every song for the entire festival, providing that you have a really, really large bladder. The first thing you need to know about Friday’s lineup is that Cass McCombs is a dude so calibrate your expectations accordingly. He’ll be followed by Edward Sharpe and the Magnetic Zeros, also a dude but his most famous song, “Home” is sung by a lady. Jack Johnson would rather be surfing and bro-chilling on the beach but he’s a super chill guy so he agreed to come headline. Modest Mouse headlines Sunday’s show, and bad news if the only song of their you know is “Float On”: I hear they’re not crazy about playing it live. But that’s OK! Because they have other good songs like “Dashboard” and “Ocean Breathes Salty” that maybe you didn’t know were Modest Mouse but now that you’ve listened it’s so obvious. You might be really, really tired of hearing “Pompeii” and the idea of seeing Bastille live makes you wonder “How am I gonna be an optimist about this? How am I gonna be an optimist ABOUT this?” But I saw them on SNL and they actually put on a good show. And make sure to show up early for local Tigerman WOAH! even if the misspelling in their name kind of bothers you. I bet your grandpa didn’t like that the Beatles spelled their name wrong, either. What else is there to do besides watch the bands and kind of sway back and forth in lieu of dancing? Or maybe just have one or two? Festival sponsors Samuel Adams Beer and Wicked Wines will be on hand with, why yes, beer and wine, and unlike past festivals you don’t have to hang out in a designated beer garden — after a change in the festival’s liquor license, you can bring your drinks over to the stages. Try not to spill your drink during the inevitable Jack Johnson mosh pit! Just kidding, his fans are super chill. There’s also food, because a man cannot survive on booze and jams alone. This year’s vendors include Tasty Burger, Chipotle, and… TGI Fridays? Yup, TGI Fridays is in the middle of a brand makeover to capture the social media crowd, and two food trucks will hand out free samples. I’m one of those annoying people who wears a massive backpack everywhere, even on the T when it’s crowded. Can I bring it? Dude, no. Backpacks and bags larger than 12″ by 12″ are prohibited. Where are you supposed to put your stuff, now that your jeans are too tight to make the pockets functional and apparently the “fashionistas” have deemed cargo shorts uncool? You can bring a small, clear plastic bag to carry stuff like sunscreen, keys, ID to buy alcohol, etc. You can also bring in food and one factory-sealed bottle of water. I have some other questions that haven’t been answered here, but have probably been asked by other people. Frequently asked, even. You are going to love this: Boston Calling has a Frequently Asked Questions page right on their Internet site! All set? Great! Have fun out there, people. Follow The Boston Calendar on Twitter and Instagram for live updates and photos. In January this year, MTBA Driver 1660 thought it would be cute to stop half a block beyond the stop. 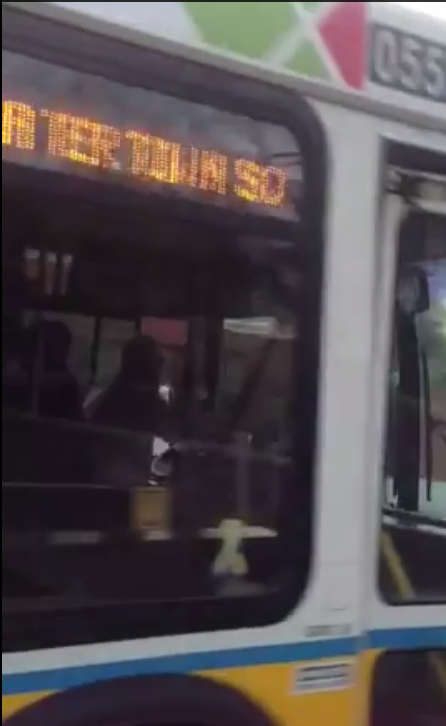 I chased the bus and got on, and he told me “Sorry buddy. There were some girls up the street so I stopped near them. If I got to choose between you and girls, I’m choosing the girls.” I told him I didn’t really appreciate it, but I kept my cool, sat down and started talking to another passenger about mobile devices (the kid was asking about my iPad). 1660 must have thought I was cursing him out, because he started shouting at me that if I didn’t behave, he’d call the police. On subsequent trips, Operator 1660 started making me chase the bus repeatedly. Stopping and starting so I’d start towards him, then moving again. I started videoing the bus as it approached. In March I had my camera out as Operator 1660 bypassed me. Unfortunately the video didn’t come out very good. The MBTA Phone operators sympathized with me, but didn’t have any solution other than “Wait for the next bus”. It was freezing that night and I waited outdoors for an additional 40 minutes until another driver came. I got a limp apology email from the T.
Then on Friday May 2, 2014, Operator 1660 bypassed me again. I got it on video, this time much more clearly, and that is the link I’m posting now. The 59 route in Needham isn’t serviced by any other buses, comes once every 45 minutes (less often on the weekends) and stops running early. I’m on the phone now with the MBTA trying to find out more information. I will update as I can. They are looking into what came the last time this was investigated.